I teamed up with #WeekdaySupper to share with you a week’s worth of tasty, quick meals that is sure to please the palate and the belly. 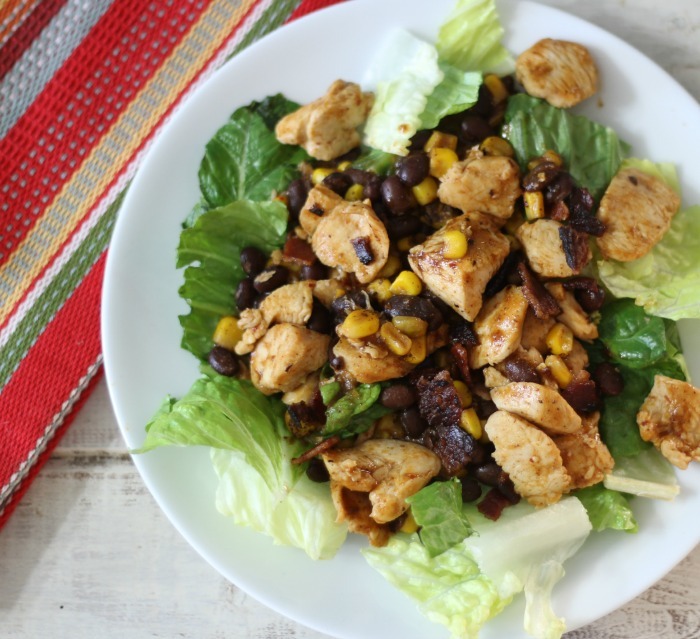 Today I have for you a super simple, flavorful salad that is loaded with chicken, black beans, corn and McCormick’s Smoky Applewood BBQ Chicken with Bacon Skillet Sauce. Amazing! No dressing needed with this salad. This salad took less than 15 minutes to make and tastes out of this world. It has a nice smoky southwestern flavored barbecue sauce with hints of bacon. Oh you know me and bacon! To zip up my salad and to keep going with the southwestern flavors I decided to add a little bit of black beans and corn. 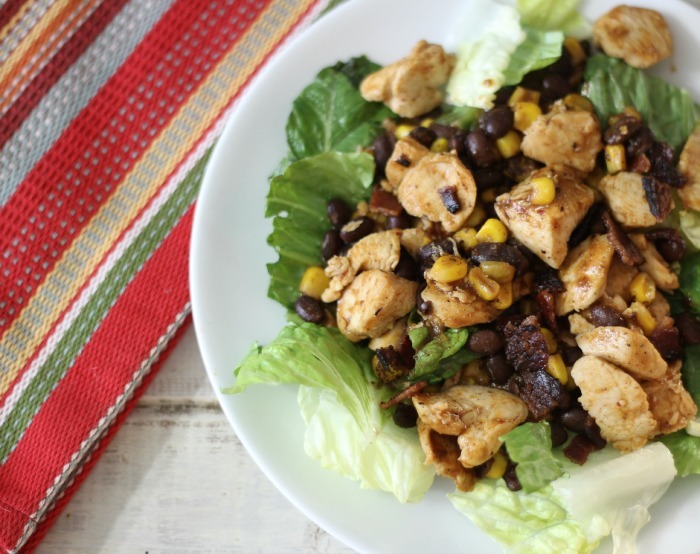 Black beans and corn are a perfect complement to this salad. But you know what? Skip the lettuce and add it to a flour tortilla and you have some awesome tacos! I did that the next night with my leftovers. I added a pinch of hot sauce and sour cream and oh man was it good!! 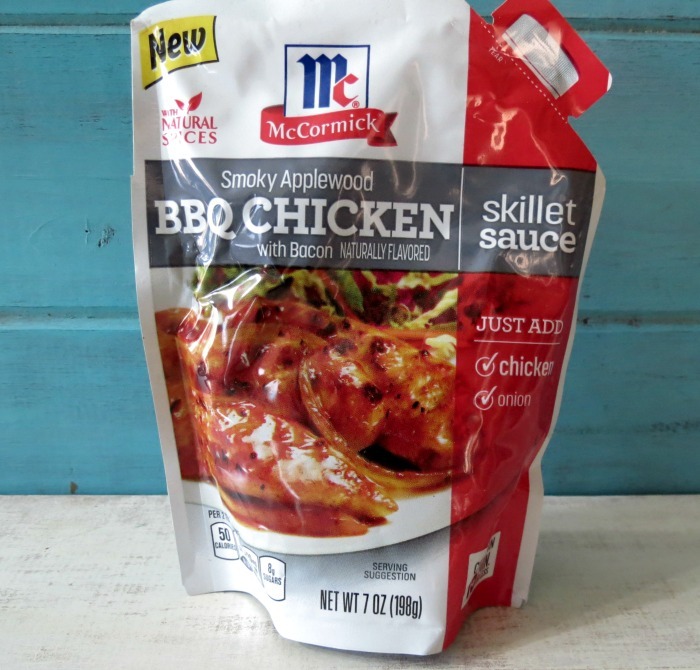 Have you tried McCormick’s Skillet Sauces? I love the Smoky Applewood BBQ Chicken with Bacon Skillet Sauce. It has a sweet, smoky flavor with a slight onion flavor and hints of wonderful bacon. This would also make for a great simple chicken dinner, sided with a salad and maybe some potato salad. 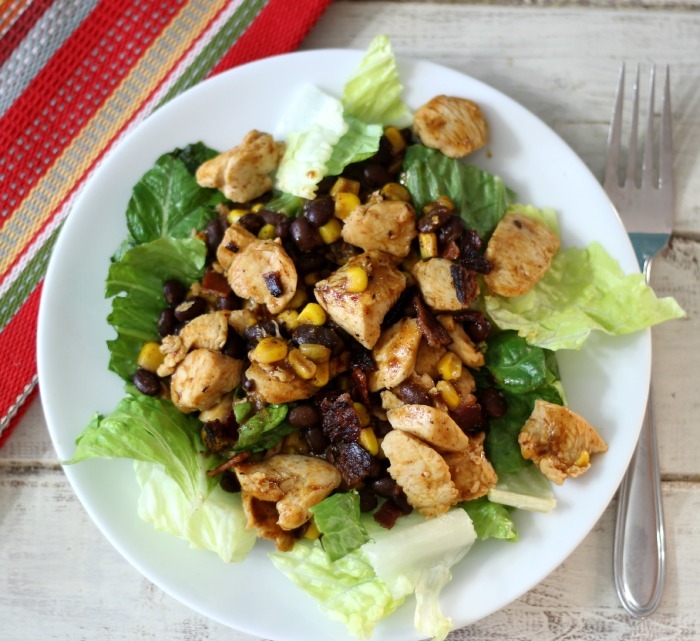 A simple, sweet smoky barbecue chicken salad made with black beans and corn. In a large skillet, add olive oil and chicken. Cook chicken until no longer pink; about 10 minutes. Add black beans, corn and McCormick Simmering Sauce. Cook for 5 minutes or until the corn is thawed. Evenly divide the lettuce between 4 plates and evenly top with chicken mixture. I love how simple this meal was and I love that my family loved it too!! 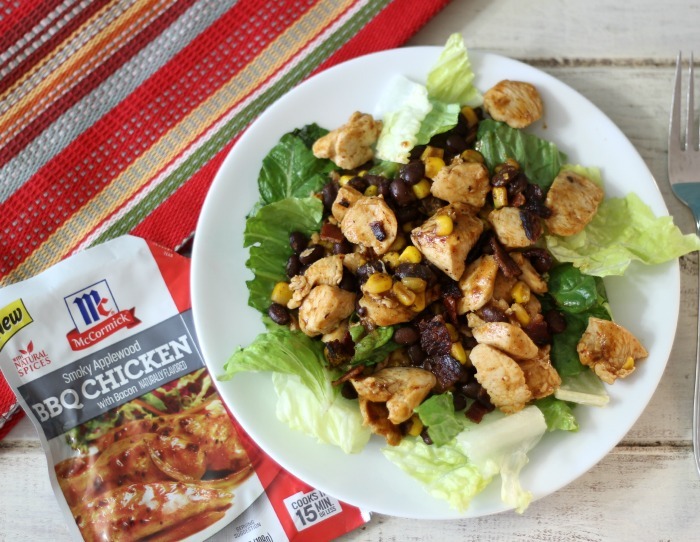 If you’re looking for other great ideas using McCormick’s Simmering Sauces you should check out the Pinterest page. There are so many tasty recipes there! Not sure what to have for dinner this week? Here is this week’s recipe menu for you. What a great salad idea, Jennifer! I love a salad with a kick and this one looks wonderful! Thank you Renee! 🙂 You know me with a little bit of kick! Thank you Nichole! It’s one of my new favorites! This is not your average salad. I could eat this every single day. Love it! Pinned. Thank you! It makes for a great dinner or lunch too! What a terrific entree salad! I love everything about it, Jennifer!!! Thank you Liz! I do love it too! I do love quick weeknight suppers that are chock full of spices and tons of flavor. You outdid yourself on this one Jen.